Thanks to Dr. Billie Fyfe, Robert Wood Johnson Medical School, New Jersey (USA), for contributing this case and much of the discussion. To contribute a Case of the Week, follow the guidelines on our Case of the Week page. Looking for high quality neuropathology antibodies? As a leading provider of neuroscience antibodies, Covance offers a variety of neuropathology antibodies for immunohistochemistry on formalin fixed paraffin embedded tissues. Covance�s neuropathology product line is highlighted by neuron specific enolase (NSE), synaptophysin and chromogranin. In addition, Covance also offers antibodies and ELISA assays for neurodegenerative disease research featuring gold standard beta amyloid clones 4G8 and 6E10-offered exclusively from Covance. Visit our website at www.store.crpinc.com to learn more or call 1.800.922.2226. (2) In April 2010, we had record traffic of 8,832 visits per day. Thanks for your support. (3) How can you tell what fellowship openings have recently been added? We now have a link on the main fellowships page (sorted by Specialty) at the top that you can click to find out. 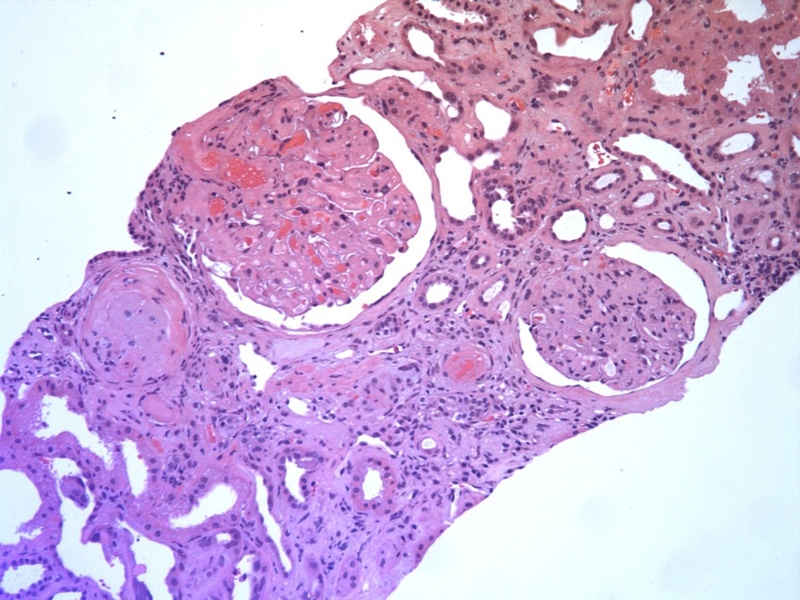 A 69 year old obese woman with metastatic pancreatic carcinoma to the liver underwent a diagnostic renal core biopsy for work-up due to three to four months of nephrotic syndrome, with proteinuria increasing from 6 to 12 grams per 24 hours. Her urinary sediment was bland and she had negative serologic studies. 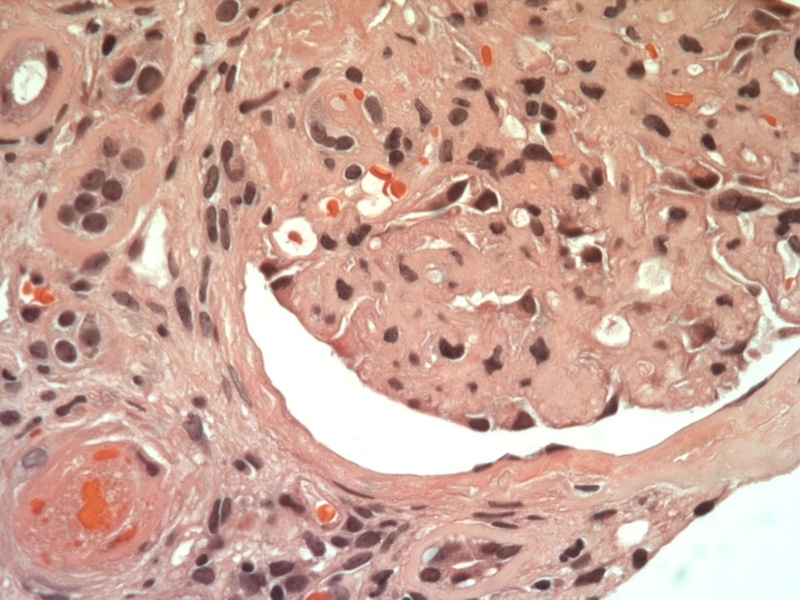 The clinical differential diagnosis included membranous glomerulonephritis, minimal change disease, light chain deposition disease and amyloidosis. Her chemotherapeutic regimen included gemcitabine. 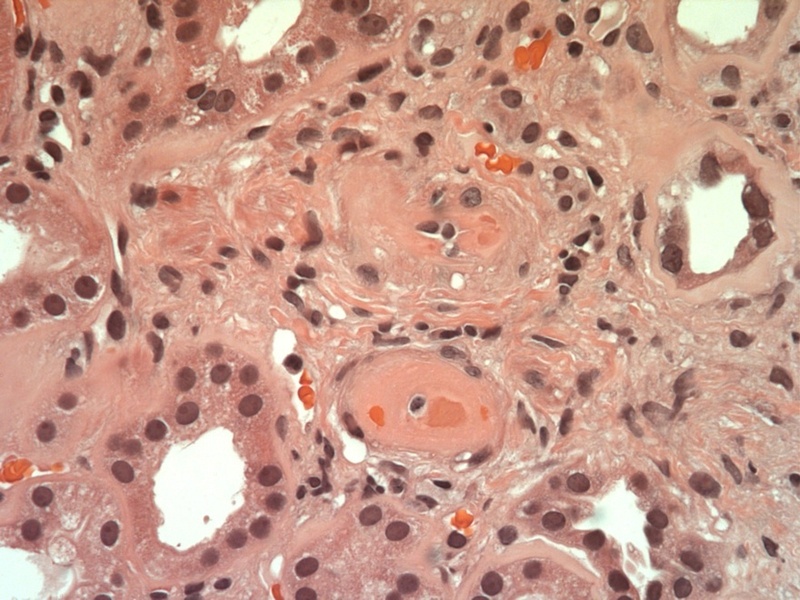 The classic features of thrombotic microangiopathy are present, including fibrin thrombi in arterioles and capillaries, including glomerular capillaries. Immunofluorescence studies were negative for immunoglobulin deposition, and ultrastructural analysis revealed moderate effacement of foot processes and subendothelial fibrin deposition, as well as endothelial swelling. No immune complex type deposits were noted. Treatment includes cessation of gemcitabine therapy, which was effective in this case. �Antihypersensitive medications, plasma exchange therapy (Z Gastroenterol 2009;47:288), or immunoadsorption columns may also be helpful. 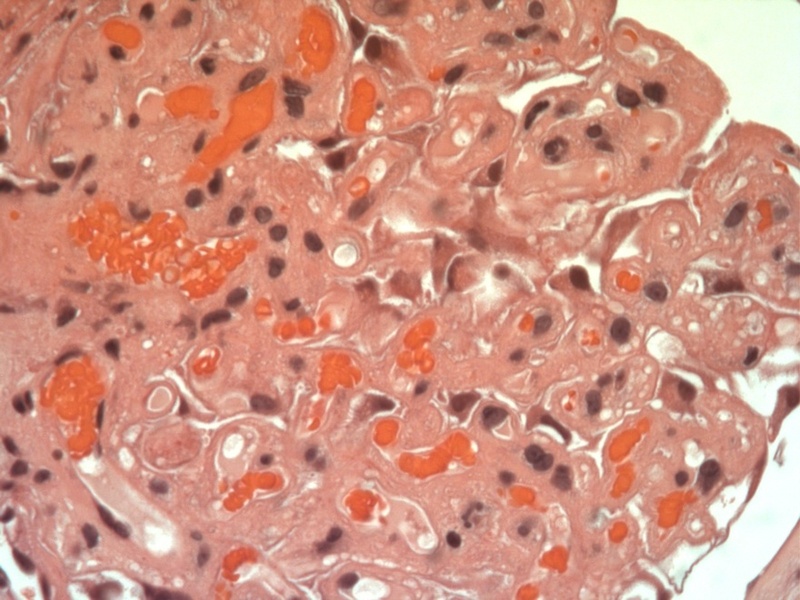 The current case is unusual in its presentation with nephrotic syndrome, as most patients present with increasing creatinine, hemolytic anemia, hypertension and thrombocytopenia.